Reading’s a funny old business. Generally, secondary school teachers expect kids to come with a pre-loaded reading module. If they have it, all well and good. If they don’t, we’re stuffed. Luckily, the vast majority of students can read by the start of Year 7, even if they say they can’t. But being able to read and being able to access the kind of material required to be academically successful are not at all the same thing. When I started teaching I knew next to nothing about reading, and I was meant to be an English teacher! Because it was something I was able to ‘just do’ I assumed that would be pretty much the same for everyone. It’s not. Some – perhaps even most – students can just do it, but those that can’t may well need some extra help. The following five hard-won nuggets of information are the product of long experience and extensive study. I hope they prove useful in the months ahead. 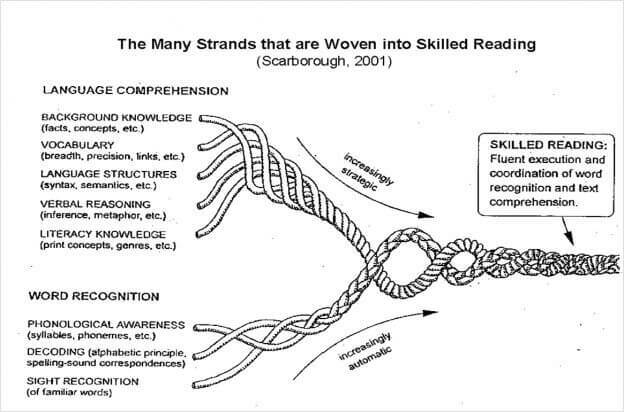 The ability we call reading is vastly complex. It’s made up of two very different skill areas: word recognition and language comprehension. Teachers rely on children’s language comprehension skills to deliver curriculum content, but this is very difficult if students have shaky word recognition skills. Although comprehension is very closely linked to intelligence, decoding, the ability to turn letters (graphemes) into sounds (phonemes) isn’t. It’s perfectly possible for students to struggle to read and be intelligent. Likewise, it’s equally possible for students to find reading easy but struggle with understanding. Struggling to read is a teaching problem and can, for the most part, be solved by better teaching. Psycholinguist ED Hirsch Jr says, “If decoding does not happen quickly, the decoded material will be forgotten before it is understood.” We expect fluent and accurate decoding to be one of the first things children learn in primary school. Often though, although children can read, they can’t do it quickly enough. Normal reading speed is 300 words per minute; if reading speed falls below 200 words per minute, comprehension begins to suffer. For a skilled reader, word recognition skills have been automated and embedded in long-term memory. When we read we don’t have to consciously think about any it and our fragile working memory is free to infer, speculate, hypothesise and anticipate. Although you probably know what all the individual words mean, you may not have any understanding of the context. Can you work which of the following best represents the main ideas in the passage? Intuition must occur through a category. Maybe you can, but are you any clearer about what the passage means? Unless you’ve studied Kant’s Critique of Pure Reason you’re going to be on a back foot. The only way to reliably understand a text is to have sufficient background knowledge to make sense of the concepts. As a teacher, this simply means you need to make sure students understand the concepts that underlie a text before giving it to them to read. Even if you have sufficient general knowledge, you still need to know what the words mean. Surprisingly, we need to know 90-95% of the words in a text in order to understand it (Nagy & Scott 2000.) This may seem high, but 5% would be about 10-15 words a page. Imagine reading something where you have to look up 10 words a page; your working memory would very quickly become overloaded and you’d probably give up. Vocabulary breaks down into 3 tiers. Tier 1 is the vocabulary of spoken language and not something we need to worry about much in schools. Tier 3 is specialised, academic language – key words. We’re pretty good at teaching these because a conceptual understanding of say, osmosis, depends on knowing what the word means. The problem is with Tier 2. These are words which are common in written texts but rare in speech. Unless you read, you won’t encounter these words, but to readers their meaning is so obvious it’s hardly worth mentioning. Academic success depends on being familiar with the language used in text books and exam papers. You may understand a concept, but if you don’t know the word used to label it you’ll be at a huge disadvantage. I’ve written about some solutions here. Students who read for at least 20 minutes per day and enjoy reading do better at school. Indeed, according to the Institute of Fiscal Studies, reading ability at age 10 predicts future income at age 42. The more you read, the wider your vocabulary and general knowledge will be. Unfortunately, unless you’ve embedded word recognition skills in long-term memory you’re probably not going to enjoy reading: it will be laborious, effortful and dull. Many many students report ‘hating’ reading. In a piece of very unscientific research I did with a school students reported that reading was for old people and people with no friends. Not cool. But even though some children ‘hate’ reading, everyone loves stories. Stories occupy a ‘psychologically privileged’ position in how we think and understand the world. One way to harness students love of stories is for teachers to read to them. Primary teachers do this regularly but reading aloud tends to be frowned on in secondary schools. We get our knickers in a twist about trying to prove progress and other such nonsense. This post contains some ideas about how to get students to read for pleasure. Knowing this stuff won’t magically make your students read better but it will make you a more effective teacher. Whatever your subject, at some point academic success depends on students’ ability to read. If you understand a bit more about the processes and why some children struggle, you will be better placed to adjust your classroom practice and refer students for appropriate support. I’ve also written about the five most useful things teachers should know about writing. Thanks. I’ll be honest, it’s never occurred to me to give much time in class to the Tier 2 words (unless pupils ask me about them). In Science we spend a LOT of time on the Tier 3 stuff but I can see now how actually the Tier 2 words can be limiting comprehension. This piece is brilliant. There are social, health and developmental issues too, of course. I have always thought that every large secondary school should have a “mezzanine” class. Children who have not managed to reach the required levels of skills in primary school in order to properly access their learning in secondary school, should be able to spend their first year in the secondary school, within a small class receiving expert help, entering year 7 one year later. Children don’t just need teaching, they also, often need development time. There is a lot to cope with on transfer to secondary school – more transport, new larger building/s, changes of classroom for subjects, changes of teachers for subjects, new pupils to get along with, having to cope with all your “stuff” P.E. and otherwise etc. etc. Many small primary schools probably only have one or two children with learning difficulties and not even every year, so that it is difficult to provide expert help. These children suffer from being the only one socially and emotionally. A large secondary school will receive a larger group of such children on intake. These children could form this “mezzanine” year group, receive the expert teaching and have a catch up year during which they can learn to adjust to the building, travel etc. before embarking on the Year 7 syllabus. Though expensive, I think it less costly than have them struggle all through with teachers struggling to meet their needs while delivering the required curriculum. What do you think? And so, as you say, one approach is to try to focus on Tier 2 words to increase vocabulary recognition. Useful stuff for lessons. This assumes that the words are not understood because they are not in the child’s vocabulary range. That’s true for some words but, in addition, I’ve found, students often don’t understand some words they read because they don’t recognise them – they DO know and understand them, but they just haven’t read them correctly. This reduces their overall understanding of a text still further. For many years as a secondary English teacher, I rarely listened to my students read 1:1 to assess directly how they lifted words off the page, what errors they made and how they reacted to words they didn’t instantly recognise. Now, with a student of any age, this is one of the first things I try to do to see whether or not they are making decoding errors which are undermining their comprehension of vocabulary and, so, overall meaning. If so, it needs addressing. As an example, a boy with average reading results for his age, who likes reading, reads often according to his mother and can read sophisticated words like ‘orchestra’, ‘choir’, ‘circumstances’ and ‘exhausted’ on sight, when asked to read a simple fiction passage aloud, read ‘scrunchy’ instead of ‘scratchy’, ‘stripped’ then ‘stritted’ for ‘stirred’, ‘cram’ for ‘cream’, ‘wide’ for ‘wild’ and ‘werve’ for ‘wove’, to name 5/21 misread words in 42 sentences, around 6-7% of the words in the text. This is known to be common in primary school but parents and fellow teachers tell me that it is also true of a significant number of secondary school children. The boy turned five real words (at least three of which he would have understood if spoken) into words that are alien to him: stritted for stirred, scrabbler for scribble, ragging for rigging, werve for wove, trattled for tattered. Although ragging is a word, it isn’t one he recognises. When the boy guessed individual unfamiliar words incorrectly, whole sentences were rendered meaningless to him but he kept going. Some words were pivotal in a sentence, some were not and so, overall, he was able to pull together enough meaning to answer some comprehension questions correctly. However, when I read the passage to him myself, he was able to answer nearly all questions correctly. Limited decoding skills prevented best possible comprehension of the text for this boy. Moreover, if he had been able to accurately decode words that he didn’t understand (he wasn’t), e.g. ‘rigging’, he may, from the rest of the correctly decoded sentence have been able to guess the word’s meaning and so make better sense of the passage. However, if an unknown word is guessed wrongly and incorrectly identified as substitute known word, the real word’s meaning will not be deduced at all. If a word is guessed incorrectly rather than identified as unknown, confusion is more likely and comprehension may be hindered rather than maximised. This boy misread about 6% of the words in the text. I didn’t try to measure how many more he didn’t understand because of his own vocabulary limitations. I imagine that this would have increased the ‘not understood’ percentage further. Recognising that there are two factors that may contribute to an inability to understand vocabulary when reading is very important for secondary teachers of all subjects. We need to spot readers with limited decoding strategies who, despite reading relatively well, are still unable to recognise all words that they know. We need to implement strategies to teach them how to decode accurately, no matter how old they are, as well as find ways for our students to expand their knowledge of vocabulary. Taking time to ensure that secondary students are able to read accurately may help with the age-old reading for pleasure problem too, for which we need a solution if we are best to extend understanding of vocabulary. As you say, everyone loves stories – ‘stories occupy a ‘psychologically privileged’ position’ – and we have no problem encouraging students to watch films, watch plays and play computer games which are all narratives – journeys through worlds while things happen. In fact, adults often actively discourage children to watch films and play computer games and yet we never put them off despite our best efforts. Many children love to watch Harry Potter but don’t want to read it. The story is much the same, the characters and action too. The only real barrier to the story, characters and action is the print. Perhaps boys don’t prefer non-fiction books after all (do they prefer to watch documentaries to watching Minions?). Perhaps, in general, boys just find reading harder, are, on average, less skilled readers than girls and so prefer non-fiction with shorter snippets of text and more pictures to ‘read’ instead. Perhaps reading a fiction book for many boys (and girls actually) is like watching a pirate film – fuzzy screen, poor sound, stretched heads – unbearable. Or like watching a film with a dodgy WiFi link so it constantly pauses for buffering – unbearable. No matter how much we love a film, if the quality is compromised and watching is impeded in some way, we hate it and switch it off. If the print of a book is hard work, ‘fuzzy’ because less than 90% makes sense, and time-consuming to ‘download’, it must become unbearable in just the same way. The story, therefore, no matter how exciting, will be discarded. Reading for pleasure is impossible if the act of reading is painful.